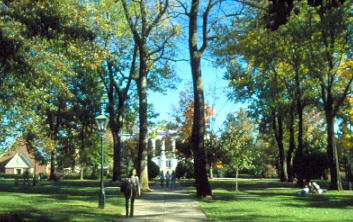 In all fairness, Hollins is a good school, IF one studies in the top majors and takes advantage of everything. However, I speak from hindsight. Twenty years ago, I did not know that I was going to be interested in some of the things that I am interested in now, or I would have better planned my major and studies around them. My major in German was not worth the paper it was written on. The German classes at Hollins during the years 1982-1986 did not emphasize reading, speaking and writing German, nor did they offer language labs. They consisted of "scotch" courses given to Army recruits. I wanted to learn German so that I could read the works of early twentieth-century psychiatrists without struggling or having to use a dictionary. Therefore, I was cheated in this respect, as well as there being no study abroad program. This lack of fluency hurt me in a later doctoral program, so much so that I fell into a deep depression and dropped out. However, a lot of the other courses I took were excellent. The music department was strong for a motivated and talented student, and the philosophy, English, and classics departments had much to recommend for them. When I took my GRE's for graduate school, they were very high, so I must have learned something. However, today, I might look at a college with a better German program.